Constable of Norwich castle 8 Mar. 1411-25 July 1413, 3 Aug. 1413-d.
Treasurer of Henry V’s household and ex officio treasurer of war 1 Oct. 1421-8 Nov. 1422. J. p. Suff. 7 July 1423-34, 16 July 1438-d., Norf. 2 Nov. 1429-Oct. 1431, 19 Nov. 1432-Mar. 1434, and ex officio, as chief steward of the duchy of Lancaster, in 16 southern counties 1437-d.
Commr. to raise royal loans, Norf., Surr. July 1426, May 1428, Mar. 1430, Feb. 1434, Feb. 1436, Norf. Nov. 1440; of inquiry, Norf., Suff. Nov. 1427 (concealments), Mar. 1438 (evasion of customs), S. Wales Feb. 1441 (treasons); to take musters, Kent Apr. 1430,4 Winchelsea Apr. 1433; of sewers, Lincs. July 1434, Lincs., Northants., Hunts., Cambs. Feb. 1438, Aug. 1439, Jan. 1441, Norf. May 1438; to assess contributions to subsidies, Norf., Suff. Jan. 1436; distribute tax allowances, Norwich May 1437; of oyer and terminer, Suff. May 1438; to guard against unlawful assemblies Aug. 1440. Chamberlain of Henry VI’s household 1 Mar. 1432-d. Member of the King’s Council 8 May 1432-d.
Constable of Wallingford castle and steward of the honours of Wallingford, St. Valery, the Chiltern hundreds and 16 lordships 4 Jan.-Feb. 1437, jt. 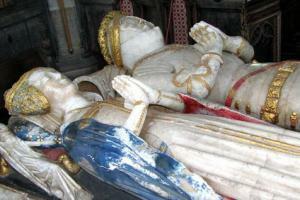 holder of the same with William de la Pole, earl of Suffolk, 22 Feb. 1437-d. It was no doubt with Erpingham’s help, and with the full approval of Henry IV, that Phelip came to make the important marriage which was eventually to give him territorial standing in several counties. By the summer of 1408 he had secured the hand of one of the daughters and coheirs of Thomas, late Lord Bardolf, whose estates had been forfeited three years earlier for rebellion in support of the earl of Northumberland. The King had granted the confiscated honour of Wormegay to his own half-brother, Sir Thomas Beaufort, and other Bardolf lands had gone to Sir George Dunbar, Sir William Bardolf (Lord Bardolf’s brother) and the queen. Then, too, Lord Bardolf’s widow held certain properties in dower. 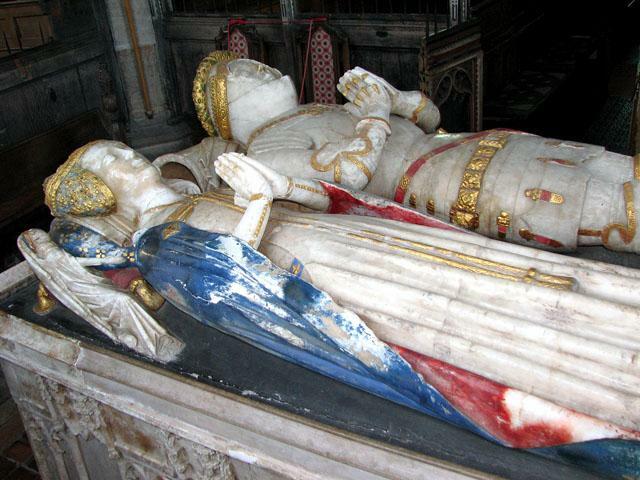 Yet over the years Phelip and his wife, Joan, in association with her elder sister Anne (wife firstly of Sir William Clifford, who died in 1418, and then of Sir Reynold Cobham of Sterborough), gradually secured possession of all of the Bardolf estates. It was a long process: in 1408 they paid 200 marks to recover the lands held by Dunbar, along with the reversion of the properties held by Sir William Bardolf; and they brought suits in Chancery against Queen Joan and in opposition to Lady Bardolf’s claims to jointure, thereby succeeding in obtaining the reversion of the manors held by the former, but being formally required a few years later not to trouble Lady Bardolf further. In 1413 judgement in another suit won them Hallaton (Leicestershire) from the queen. Lady Bardolf died in 1421, followed by her brother-in-law two years later, but seisin of Queen Joan’s holdings was not to be secured until as late as 1439, after her death. By 1438 it was clear that Phelip’s sister-in-law, Anne, would have no issue and, accordingly, the Phelips were assured of the reversion of her moiety of the estates. Thus, eventually, the whole Bardolf inheritance fell to Sir William and his heirs.9 He died in possession of holdings in ten counties, conservatively valued at £400 a year. 1. De Antiquis Legibus Liber (Cam. Soc. xxxiv), pp. cxlvi-ccii; CP, i. 420-1; PCC 43 Marche; CPL, vi. 354. 5. Somerville, Duchy, i. 428. 6. CIPM, xv. 606, 619-20; CFR, xiv. 180; Lambeth Pal. Lib. Reg. Courtenay, ff. 191-4; J. Weever, Funeral Mons. 782. 7. Norf. Arch. xxxv. 96-108; CFR, xii. 31; CPR, 1399-1401, p. 179; 1401-5, pp. 35, 89, 95, 184, 255, 493; 1405-8, p. 176; 1408-13, pp. 278, 398; E101/404/21, f. 45; Harl. 319, f. 46; DL42/16 (pt. 1), f. 43; PPC, i. 290; C1/6/3. 8. CCR, 1399-1402, pp. 332, 392; 1405-9, p. 385; Bodl. Chs. Suff. 428, 433; Reg. Chichele, iii. 406; CPR, 1405-8, p. 295; 1408-13, p. 416. 9. C137/67/31, 75/64; C138/55/11; CPR, 1405-8, p. 448; 1408-13, pp. 39, 95-96; 1413-16, pp. 2, 167; 1436-41, pp. 135, 165-6; CIMisc. vii. 382-6, 428-30; CCR, 1405-9, pp. 427, 448-9; 1409-13, pp. 245-6, 315; 1422-9, pp. 87-88, 94-95; 1435-41, pp. 297-8; CFR, xiv. 410, 412, 441. 10. C115/K2/6682, f. 63d; CPR, 1413-16, pp. 62, 321. 11. DKR, xliv. 564; E101/46/16; CPR, 1408-13 p. 470; 1413-16, pp. 67, 259; PCC 43 Marche. 12. CPR, 1413-16, pp. 383, 403; 1416-22, pp. 256, 258; PPC, ii. 252; E101/51/2; DKR, xli. 696, 775; xliv. 606, 612, 631; Reg. Order of the Garter ed. Anstis, i. 66-73; G.F. Beltz, Mems. Order of the Garter, pp. lix, clviii; CFR, xiv. 276; E364/69 m. F; W. Dugdale, Baronage, ii. 213-14. 13. Reg. Chichele, ii. 355, 361-2, 364; CFR, xv. 163, 286; Issues ed. Devon, 406; CCR, 1422-9, p. 463; 1429-35, pp. 30, 229; 1435-41, pp. 374-5; CPR, 1422-9, p. 518. 14. CPR, 1422-9, p. 212; CFR, xv. 194, 208, 222; PPC, iii. 294; E404/44/315. 15. Reg. Chichele, iii. 380-1; CFR, xv. 247-8, 281; xvi. 49, 59, 86, 314; C139/34/47, 43/8. 16. E404/46/255, 48/281; DKR, xlviii. 275; PPC, iv. 110; E364/70 m. F; CPR, 1429-36, pp. 254, 278, 349; 1436-41, p. 91. 17. CFR, xvi. 153, 334, 336; CPR, 1436-41, pp. 32, 44, 133, 366; Harl. Ch. 54 I 8; Add. Ch. 2016; Corporation of London RO, hr 163/57, 169/17; CCR, 1447-54, p. 214. 18. CPR, 1436-41, p. 117; PPC, v. 71; vi. 312-13; De Antiquis Legibus Liber, p. excvi. 19. CFR, xvii. 4, 83, 154, 248-9; CPR, 1436-41, p. 473. 20. CP, ii. 62-63; CFR, xv. 208, 211, 288; CPR, 1436-41, p. 35. 21. CPR, 1436-41, pp. 78, 390; Reg. Chichele, ii. 598-605; C139/103/30. 22. Norf. and Norwich RO, Reg. Wylbey, ff. 130-2; C139/132/30-31; De Antiquis Legibus Liber, p. clxxiii.